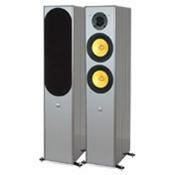 The cab seemes very well dampened and stiff without any vibrations whatsoever. The cab' supports are very nice and keeps the speakers steady up from the floor. They seem to be very versatile and works just as well for movies as for music. I played Mr & Mrs Smith this weekend and it was very fun compared to the Avantis which are more pure music due to . TOOLs 10000 Days sound awesome! The same goes for Eva Cassidy and Madrugada - The Nigtly Disease where every single detail is revieled. Pure fun. Brothers In Arms and The Dark Side of The Moon was played pretty early and need another round after more "wearing in". The lower mid-range and bass is not quite linear, but this I belive is due to the fact that they are not quite worn in yet and that I haven't had enough "research" on finding the optimal distance to the back wall. I'll update when I've used them a bit more on another amp. I just replaced my old SEAS Avanti kit with the QLN 603 mkII and that will be the comparison for this review. The speakers are not quite worn in yet but I thought I'd update along as thing falls into place. The set-up is a Marantz CD63-SE that has proven to be more than up to the task for many years. The amp is a Marantz PM66-SE. Signal Cables are from TARA Labs and to the loudspeakers are ordinary 4.5 mm2 copper cables. I use Phenix Gold plugs on the amp and direct termination towards speakers. The first impression was that these speakers are very light driven so the volume had to be turned down a bit compared to the Avantis. They go deep and are relatively linear, but adjustments of the distance to back wall is important. They are fast, responsive and playful. But since they are new, I haven't tested them on high/"twelve a clock" volumes yet. Mid range is good, with a detailed sound a bit towards the warm side. That is porbably also due to the Marantz set-up, which has a tendency towards a more "vinyl" sound. Which I like. The discant is clear and defined, not too bright but not too "colored" either. Together with the upper mid range, it provides a lively persepcitve/soundscape that more or less eliminates sound-source direction, and presents a field of sound instead of sound points. So far, everything is good.